Representatives of the American Institute of Architects’ local and national governing bodies voted overwhelmingly against supporting a new investigation into the total collapse of World Trade Center Building 7 (WTC 7) at the Institute’s annual business meeting held in Orlando on April 26, 2017. 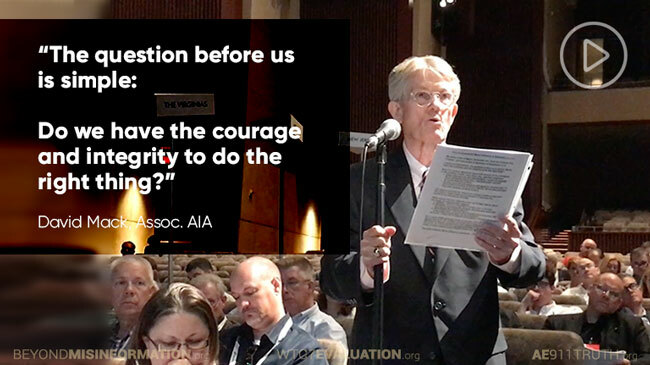 Resolution 17-5, which was sponsored by 70 AIA members — and which initially had the backing of more than 200 members before the AIA introduced a rule late in the process that required handwritten signatures from sponsors — garnered 4% of the vote from delegates. The 4% tally was a setback to concerned AIA members and activists who had hoped to continue the upward trajectory that saw support for a reinvestigation grow from 4% in 2015 to 11% last year. The tepidly-worded position issued by the AIA’s board of directors — identical to last year’s position — was that WTC 7’s collapse “has been investigated thoroughly by competent authorities with reasonable conclusions.” But our interviews after the business meeting with two-dozen delegates who had voted “no” told a different story. The vast majority of these delegates indicated no disagreement with the argument that WTC 7 did not collapse from fire. In fact, nearly half of them agreed that it was likely — if not completely evident — that WTC 7 was brought down in a controlled demolition. Nonetheless, most of them voted “no” because, as they put it, this was an issue the AIA should not take on. “It’s not our responsibility as architects,” some said. Others felt it was time to move on. One of those who agreed that WTC 7 was demolished said he thought it would have little impact if the AIA took a stand on the issue. Perhaps most unsettling, though, were the few architects who said they simply didn’t care. 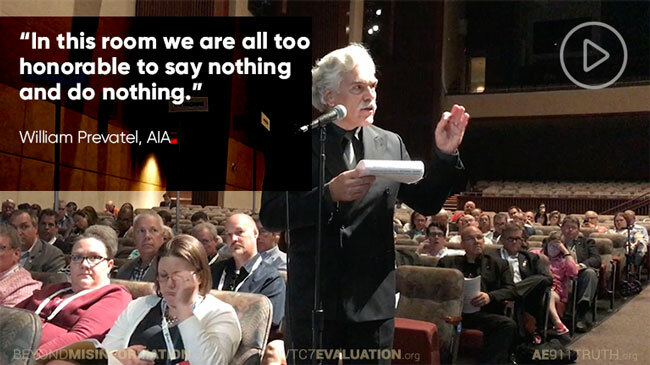 Our efforts this year were clearly hampered by two factors: the AIA’s decision to deny AE911Truth an expo booth and the fact that the business meeting was held before the convention rather than on the final day of it. The schedule change gave us no chance to communicate our message on the expo floor (with or without a booth) and resulted in fewer rank-and-file members attending the business meeting (10% fewer votes were cast this year). The Message Is Getting Out — So What’s Next? Although the outcome of this year’s vote was disappointing, our resolution campaigns over the past three years have nevertheless accomplished a great deal. 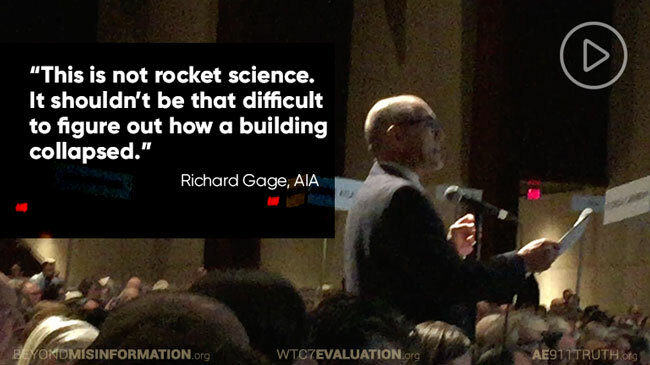 Thousands in the local and national AIA leadership are now unmistakably aware of the questions surrounding the collapse of WTC 7. They have been given numerous chances to act courageously on their newfound awareness. History will not look kindly on the professionals who shrank from these opportunities. Over the next six months, we will double down on our efforts to educate the architecture profession through our continuing education courses, which AIA and non-AIA architects can earn learning units for taking. We will also now be able to shift much of our energy and resources to promoting the WTC 7 computer modeling study being conducted at the University of Alaska Fairbanks. It is our hope that the WTC 7 study, which is scheduled to be released in August, will cause a tectonic shift within the engineering community and will attract significant media coverage. As those efforts evolve — and after surveying the AIA members who sponsored this year’s resolution — we will revisit the question of whether to spearhead a fourth resolution campaign. 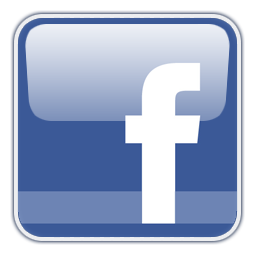 In the meantime, we’d love to have your input on how we should continue to move the fight forward. 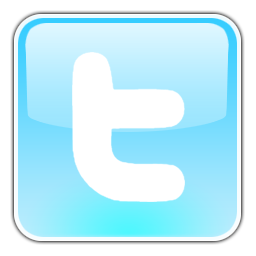 We also invite you to donate toward our work. After all, we can continue the march forward only if we have your ideas and your support. We at AE911Truth are sincerely grateful to all the dedicated activists who’ve donated to our AIA resolution campaigns and to all the courageous architects who’ve participated in them.